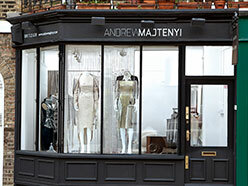 Unlike most fashion designers who start with a sketch, Andrew Majtenyi gets his inspiration from the textures, colour and feel of the fabric. Andrew has designed for the film and television, and has has worked on numerous productions. London was the obvious next step setting up a shop in Clerkenwell in 2009 and showing during London Fashion Week. Over the years he learned about filmmaking, a skill he now uses to write and direct the film shorts that open his catwalk shows. He apprenticed under master tailor Vincenzo Cardone in late 19th and 20th century tailoring, Madame Sophie who taught him advanced draping techniques, and honed his couture skills while working with the National Ballet of Canada under Oscar nominated and Tony award winner, Santo Loquasto. These theatrical influences are seen in the cut, fit and finishing of each piece.